Although a little wet due to the weather outside the first Leigh-on-Sea Fairtrade Fair was great fun with so much to see, do, taste, paint, wear, watch, and discover about Fairtrade. Thank you to all the people that volunteered their time and those companies that sponsored stalls, The Co-operative Membership, The Co-operative Food, www.fairtradevending.co.uk, Christian Aid, Tearcraft, Tradecraft, www.ambanature.co.uk, Leigh Road Baptist Church, Belfairs Media College & Gwen Cook Cakes. Take a scroll through the photos above to see what happened. 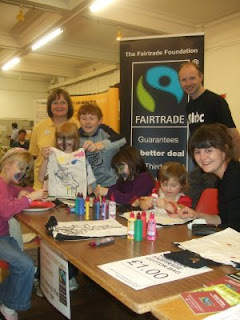 FAIRTRADE Fashion was just one of the treats on offer at a fair in Leigh on 1st November. Visitors were able to take part in a selection of games, shop at stalls and take advantage of facepainting at the Fairtrade Fair held at Leigh Community Centre, in Elm Road. A range of Fairtrade food was also on sale as well as items to taste and sip. The event was held to raise awareness of Fairtrade products, which guarantees a better deal for third world producers.